Stuff is not life. 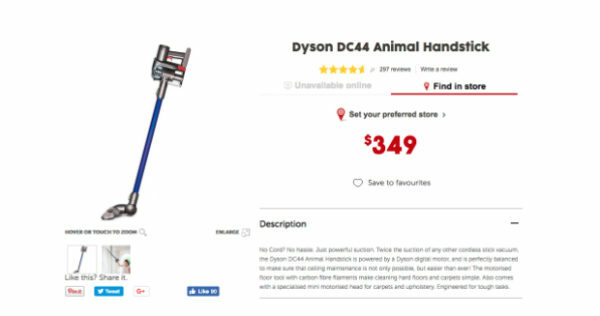 By this I mean, when Aldi announces they will be selling DC44 Animal Dyson handstick vacuum cleaners at a ‘reduced rate’ this week, it is not a matter of life or death that you get your hands on one. And just as an FYI, Target is selling the same stick vacuum for $349 and they are in stock. … might I suggest you just stump up an extra $50 and pop on over to Target or JB HiFi where you won’t have to fight, scrum and elbow other people out of the way, all for the indignity of missing out. My question to all of you is: what is your time worth? More importantly: what is your dignity worth? Personally my time and dignity are worth exactly $50. 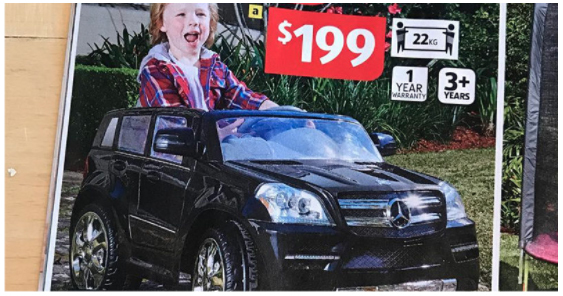 The Aldi ‘Special Buys’ promotion is a pea-under-cup manouevre: a legal form of ‘bait advertising’. Every Wednesday and Saturday they advertise limited stocks of certain ‘big ticket’ items and then they sit back and watch gleefully while you all create a news story for them: lining up outside the stores, pushing and shoving each other while doing a lot of grubby snatching and scratching to get to something that you don’t actually need in order to survive. It’s called ‘bait advertising’ because they bait you in with the specials in the hopes that you’ll turn up and do your grocery shopping while you’re there. And while bait advertising is illegal, Aldi covers their arses with very clear disclaimers that stocks are limited and vary from store to store. What you can take away from this disclaimer is this: you probably won’t get one of whatever they are advertising that week. This is not a tragedy. Because, while groceries could be considered life essentials, stuff like ride-on toddler vehicles, stick vacuums and party marquees are not. In fact, I would be so bold as to say, no-one needs one of these fugly things. 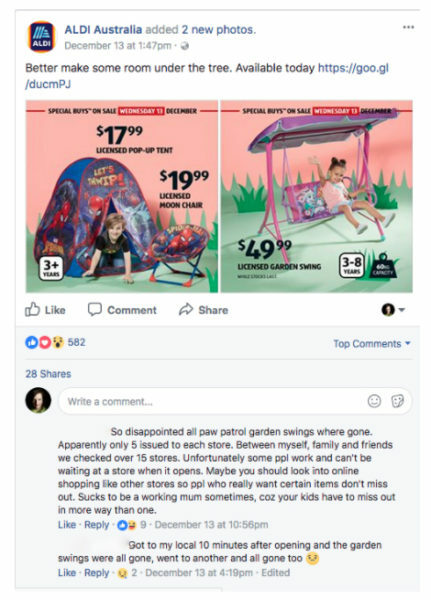 Neither is it essential that your child have one of these hideous ‘Paw Patrol’ swing sets. My point is, Aldi is for cheap tinned tomatoes and the occasional ‘surprise’ boat winch. It’s the element of surprise that makes it fun. In fact, it used to be that going to Aldi was like a grocery shopping lucky dip. Some days you would just wander in to do your usual grocery shop and there in the centre aisle bargain bin would be 100% cotton sheet sets for $20 or perhaps on a really good day, a magical folding picnic table with chairs attached. It was all about the serendipity and it was delightful. Nowadays Aldi has ensnared you in their web of consumerist bullsh**. They have programmed you to feel entitled to the ‘Special Buys’ that they dangle in your eyeline on Wednesdays and Saturdays. And like a bunch of Pavlovian fools you have fallen for it (and by Pavlovian, I’m not talking about a meringue cake). Every time you line up, get disappointed and start shouting about it, the media reports on it. Then Aldi gets more free promotion for their stores and so they keep doing it. If you’re pissed off, don’t go there anymore. It’s the ultimate consumer power. Stop buying stuff. You can. It’s not Venezuela: there’s plenty of ‘stuff’ available at other stores. 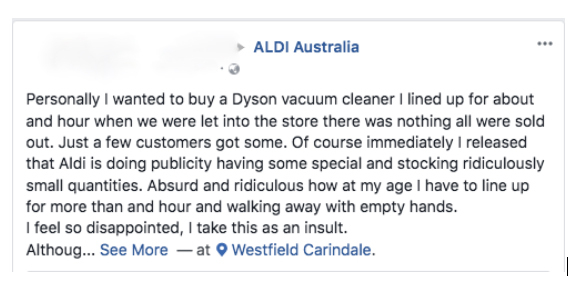 I know it seems unbearable, the thought of somebody else getting that once-in-a-lifetime bargain – that ride-on toddler vehicle, that Dyson stick vacuum for $50 less than you would pay at Target, that party marquee that you’ll be putting on the hard rubbish pile in six months time – but seriously, IT’S JUST STUFF.